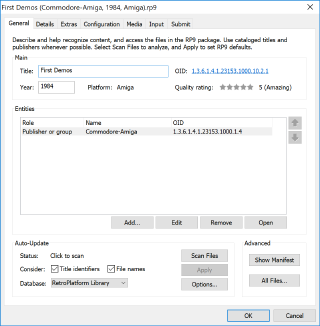 All editions of Amiga Forever include everything you need to run different emulation engines, operating system versions, games and demoscene productions in simple one-click steps. The advanced RP9 Title Editor provides professional authoring features to create and edit configurations for playback on the local system or elsewhere. 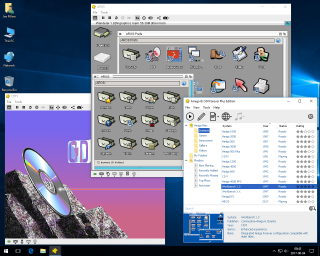 The Value Edition is a compact download for Windows, and includes Workbench 1.3 and "Kickstart" ROM versions 1.1, 1.2 and 1.3, which will run the majority (more than 70%) of classic Amiga games and applications. More than 25 games are included. 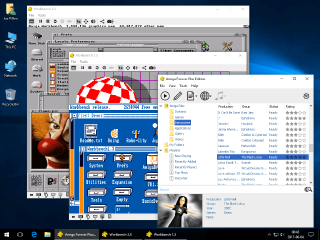 Both the Value Edition and the Plus Edition open the doors to thousands of additional Amiga games and demoscene productions which are available for free download from software publishers and Amiga history sites alike. Furthermore, the Premium Edition bundles the Plus Edition content with additional video content on 3 DVDs. Once installed on a Windows system, the Plus Edition includes the option of creating a DVD ISO image (via Build Image, in the Tools menu). The Plus Edition content is also included in the Premium Edition box. The Premium Edition of Amiga forever contains the full Plus Edition content, plus more than five hours of "must-see" Amiga videos on 3 DVDs. When purchasing the Premium Edition from the Amiga Forever Online Store you will also receive an instant license key and download link to the installer for Windows, so that you can start using the Amiga emulation and OS software without further delays, while the additional premium content is being shipped to you. Like the amount of work that went into this project, some of the most important "features" of Amiga Forever are somewhat difficult to describe. They involve your feelings when you see the system booting from a slow floppy disk into a blue Workbench screen, and you suddenly seem to remember every word that appears on that Startup-Sequence window, and by listening to the emulated floppy drive sound you appear to be able to anticipate every disk head seek, as if it was a melody. And if you never experienced this before, then... welcome to the Amiga. It is equally hard to describe the feeling of a "modern" Amiga system that just works as you would expect it to, with support for modern displays and hard drives, configuration-free internet access, a CD drive that does not require setting up drivers, devices and file systems, a mouse wheel that you could nowadays not do without, but which the original Amiga had never heard of, or a web browser preconfigured to use the same keyboard shortcuts as your PC, Mac or GNU/Linux system. With Amiga Forever, all of this attention to detail is just one mouse click away, as invisible as it is obviously ready to run.